It describes how to use the Racexpert system and find those big price winners - for example the winner of the 2009 Grand National, Mon Mome 100-1 was top rated by Racexpert. I have put together this popular resource tutorial to pinpoint the important facts from the word go and this one will quickly get you up to speed. After opening the program the first screen shows a row of icons at the top left and under these, details of your membership. Each horse in this list is given a numerical rating for 3 criteria - Rx, PR, SF, seen under these headings to the right of the screen.The abbreviations stand for Racexpert rating, Power Rating and Speed Figure rating. The default sort order is for the highest RX. To sort for the other 2 ratings, click the letters PR or SF. The other details for each horse is self explanatory but to look up any abbreviation click on the mauve book icon(A popular resource tutorial from Racexpert) at the top of the page and then Abbreviations. This help file is your main guide, to finding out about all of the features available. Under the list of horses are the forecast starting prices for the runners. If you click on Vodds, prices are assigned to horses which Racexpert believe would be good value, if you were able to obtain them. For a full explanation see Racexperts's popular resource tutorial under Forecast odds. Beneath the Prices section there are details of the trainers and how well they are performing at the course and the top trainers are assigned a rating under the RTG column. Certain trainers perform well at some courses for one reason or another and this is worth bearing in mind when considering placing a bet. If you are new to racing it is worth reading one or two books on horse race betting from authors such as Nick Mordin and Alan Potts, available from your library, an online popular resource tutorial or Amazon.com. But this guide should set you on the right path to using Racexpert effectively. With dozens of races run every day in the UK, we need to be selective and until you discover a method of choosing which suits you, I suggest you start by considering only good class handicap races. The form of the horses is accurate and Racexpert can make best use of the information available. At the top of the Racecard page, after clicking on a race to view the horses, you will see wehether the race is a handicap, followed by a letter and number in brackets eg [D4] which means it is a class D race, so choose races between class A and D.
Now that we have the racecard up we have to consider how to use the bewildering array of buttons - where to start? The first task is to produce a list of horses that have a good chance of winning in todays races. Ensure the favourite has optimum conditions eg has won recently, has won at the distance, on the going (state of the ground), preferably at the course, and that the trainer's horses have been winning recently. 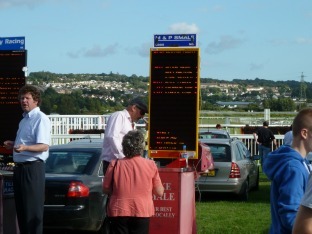 The 1st button on the top (FAV) lists the strike rate of the favourites at every course in the country. Clicking on any column will sort by that column. Click on profit/loss this shows that currently backing Windsor favourites in non handicap flat races produces a profit of 59.15 points or £59.15 to level £1 stakes. These are the three main ratings produced by Racexpert,(described in detail in their popular resource tutorial) and we can use these with other filters to obtain our selections. To recap - we have opened a racecard for a meeting checked the likely favourite and checked how often favourites win at this course. It is now worth checking to see if any of the runners have obtained a fast time in the last 30 days. Click on the brown TOP icon (8th along, top left). This produces a list of horses producing the top 10 speed figures in the last 30 days for each code of racing ie Chase, hurdle, flat or All Weather. These horses often go on to win again so it is a good idea to click on the button 'Append Horses to current Horses to follow list. For further information see Racexperts's popular resource tutorial. We can now check to see if any of these 'fast' horses are running in the race we are looking at. There is a Tie-on address label icon next to the printer icon just above the list of horses for this race. Clicking this will check to see if any of the 'fast horses' you added to your horse to follow list are running today. Generally speaking these horses will be running in good quality races, more often than not on a Saturday. 1. 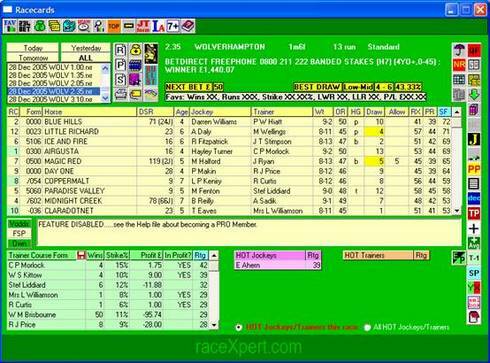 On the racecards screen, click the purple icon with a black horse in front, just to the right of the list of races. This checks to see if a horse has won or been placed in the last 4 days (an indication that the horse is at peak fitness). Racexpert puts any qualifiers under the heading 'Watch The Market'. Also horses run by trainers who have recently won a good percentage of races which Racexpert puts under the heading 'Secret Weapon'. 2. On the racecard's top row of icons click 10th from left, JT form. Here we can check recent form for trainers and jockeys - if you already have a possible selection for a race. 234 BET icon - This small but useful utility allows you to see whether or not you can make a profit from backing between two and eight horses in the same race. Green Bag of money icon - allows you to enter and keep a track of any bets you place. Useful for testing out your selections before you actually part with any money. Magnifying glass and graph icon researches betting systems for you, confusingly, Racexpert describes it as a tool to Research top rated horses. 7+ icon displays horses that are clear top rated under a variety of ratings/features in RaceXpert for todays meetings. For full details see Racexperts's popular resource tutorial. This feature can also be used to to produce our list of horses to assess for the days racing. One useful tool that you will no doubt wish to try is the Research top rated horses facility. This is used to create betting systems. You can create your own, find free ones on the forums, or purchase systems from Racexpert (see their popular resource tutorial). As mentioned earlier this facility is opened by clicking on the Magnifying glass and graph icon at the top pf the racecards screen.A wide variety of options are available and it is possible to save each system you create and store it in an appropriate section. There is a large help section to guide you in the creation of systems, described in detail in their popular resource tutorial. We should now have a list of horses to back and used the features described above to whittle these down to one or two. It is best to do this for a period of time before actually backing the horses you select as this will give you a better idea of which methods are producing profitable results. For long term profits it is best to pick your selections that have the higher prices. Many features allow you to save the results to the Racexpert folder. This can be accessed on your C drive, Program Files, Racexpert. A full explanation can be found on Racexpert's popular resource tutorial. It is also a good practise after a win to hold back from backing anything for a couple of days. Savour the wins and avoid souring them by backing when over confident. If you have any questions on the use of Racexpert or this popular resource tutorial, please send your questions via the Contact Us form.